The aim of the Society for Tropical Ecology, which was founded in 1987, is to further the study and understanding of all aspects of tropical ecology. A primary means toward this scope is through the organization of annual international congresses, usually four days in February in Central Europe. Invited international plenary speakers contribute papers and discussions on selected themes of either outstanding universal topicality or of special relevance to up-to-date issues in tropical ecology in order to promote scientific exchange with the participants, many of which usually are students. The conferences provide an international platform for the exchange of scientific ideas and the establishment of collaborations between members and their guests. The gtö is especially dedicated to fostering junior research and equitable cooperation projects. At the annual meetings, the best three talks and the best three posters of young scientists are awarded with the Merian Award. In 2012, the Elisabeth-Kalko-Memorial-Lecture was established in memory of our former vice-president and highly esteemed colleague Prof. Dr. Elisabeth Kalko. The lecture is open to the public and is given in the language of the hosting city in order to establish a link between the society and the public. Since 1995, gtö publishes its own journal ECOTROPICA, an international, refereed journal containing original papers and review articles. The gtö is open to all interested persons. 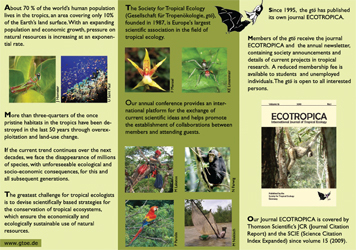 Members of the gtö receive the journal ECOTROPICA and the annual newsletter for free. Since 2009, the gtö has a group entitled “Society of Tropical Ecology gtö” on facebook and LinkedIn. Everybody is welcome to subscribe to these groups and by those means share information on activities of gtö and its members, start discussions, be informed about meetings and deadlines.